I recently read the incredible book Eat Move Sleep (Tom Rath, 2013). I would highly recommend this book to you. The premise for the book is “how small choices lead to big changes.” When you make better choices in the moment, it benefits your overall health and well-being. While you can’t change your family history, you can change your family future by making better choices today. The bottom line is that eating right is not enough; exercise alone is insufficient; and sleeping well, in isolation, is not adequate. When you focus all your energy on just one of these pursuits, it often comes at the expense of another. It is essential to think about all three elements together. 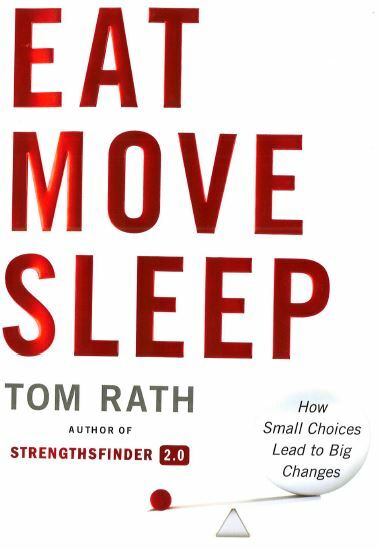 For the purpose of posting in this blog, I’ll separate my favorite content from the book into the three categories; Eat, Move, and Sleep. Sleep: Sleep longer to get more done. The typical mindset is to get more done by sleeping less, which is completely opposite to what actually happens. Ericsson’s 1993 study suggests that the average person performs optimally with 8 hours and 36 minutes of sleep. The average American gets just 6 hours and 51 minutes of sleep on weeknights. Studies show that sleep loss increases risk of getting sick. Eliminate as much light as possible. Decrease TV watching before going to sleep. Our sleep is enhanced when it’s cooler. Memory is enhanced during sleep; everything you’ve learned the day before is encoded and filed in your brain for later recollection. Less sleep time cuts this process short, and studies have shown that sleeplessness is a big factor in memory loss. Try exercise instead of sleeping pills; no matter the time of day. One of the biggest impediments to sleep is what you do in the hour before you go to bed. NO stress-filled activity like checking emails, stressing about finances, arguing with spouse, or watching scary movies. Leave at least one hour to unwind before sleeping. Consider adding “white noise” to your sleep. Not only will it help you sleep through distractions, you can also take it with you when you are away. The challenge is to find the right threshold of background noise to eliminate the unwanted noises while still allowing you to hear smoke alarms or other critical noises. Losing weight is one of the best ways to counteract fatigue. Fortunately, better sleep helps with weight loss over time. Start with swapping an hour of television for an hour of sleep. A study on this topic suggests that doing so could result in a loss of over 14 pounds over a year. Remember, it starts with your next meal; one day of eating right and sleeping well sets a positive cycle in motion. The better you sleep; the better you eat. If you sleep less, you will eat more, remember less, get sick more often, and you will look bad. When you think about your health, sleep often gets pushed to the back burner but it is a trap. Sleep is not a luxury; it is a basic necessity. For the purpose of posting in this blog, I’ll separate my favorite content from the book into the three categories. I’ll update weekly, so please check back! Move: Make inactivity your enemy. In today’s society, we sit far longer than ever before. With the click of a mouse, one can accomplish far more than ever before. However, while this increases efficiency, it comes at the expense of our physical health. Exercise alone is not enough. 11 hours of sitting cannot be offset by one full hour of exercise. Calories continue to burn after a high-intensity workout is done, sometimes for several hours. Work out in the morning, if possible. While working out in the evening is better than not working out at all, you’ll miss the positive benefits. Some studies suggest that a mere 20 minutes of moderate activity will significantly improve your mood for the next 12 hours. Align yourself. Take turns on which arm you carry something. Change your desk around, including monitor, phone, and peripherals. Include as much variability as you can often, to decrease burdening one side of your body. Your brain works better following exercise. Research shows that exercise creates an immediate benefit for your memory. Exercise a little more than you already do. Start small; some activity is always better than none. The last thing you want to do is set a goal so unrealistic or intimidating that it deters you from doing anything at all. Exercise isn’t just about physical improvement; there are many mental benefits as well. Eat: Every single bite is a net gain or loss. Forget diets; short term gains will get lost in long term. Study Carbohydrates vs. Proteins; try to achieve better than 5:1 – many snacks are 10:1 or worse. Sugar is a drug; the more you consume, the more you want. Consuming sugar early in the day sets you up for a day-long craving. Avoid “added sugars” when possible. Ideally, look for products containing less than 10g of sugar. Pick one food/drink that you would normally add sweetener, and for one week, try eating/drinking without adding the sweetener. Refined Carbohydrates are another addictive drug (in this case, “refined” does not mean better!) We get enough carbs from fruits, vegetables, and protein. Do everything you can to replace refined carbohydrates with vegetables when you prepare or order a meal. Try to find natural snacks like nuts, carrots, apples, celery, kale chips, or seeds. Don’t let your stomach get too empty; it could easily turn into overeating. Don’t eat too fast; aim for 20 minutes, which is a good, general guideline. Bread is a lot worse than we think. High fat foods decrease your energy and your mood later in the day. Eating poorly will make a bad day even worse. Consider your relationships with others when choosing what to eat. When given a choice, pick the form of food closest to how it was originally grown. Example; dried fruits or juices have 10 times the sugar of the original whole fruit. Most advertising is deceptive. The more claims a product makes, the more you should be skeptical and ask the right questions. Buy “use it or lose it” foods. Foods that do not last for years on a shelf are usually healthier. When eating a big meal, start with the healthiest food first. Doing so will ensure you get the most out of the healthiest options, and possibly leave unhealthy options left-over. Some studies suggest that drinking a glass of water before a meal actually results in weight loss. Your greatest health risks are individual to you (that’s why doctors ask so much about your family history.) Do some research; find out what foods you could eat to decrease your greatest risk. Every bite and drink counts. You don’t get healthier by simply trying to eat better in general. You improve your health on a bite-by-bite basis.